The fanatic who beheaded an American journalist was last night named as one of a gang of British jihadis known as ‘The Beatles’. As a massive manhunt was launched, a former hostage said he believed the masked Islamic State maniac was a Londoner he had known as ‘John’. 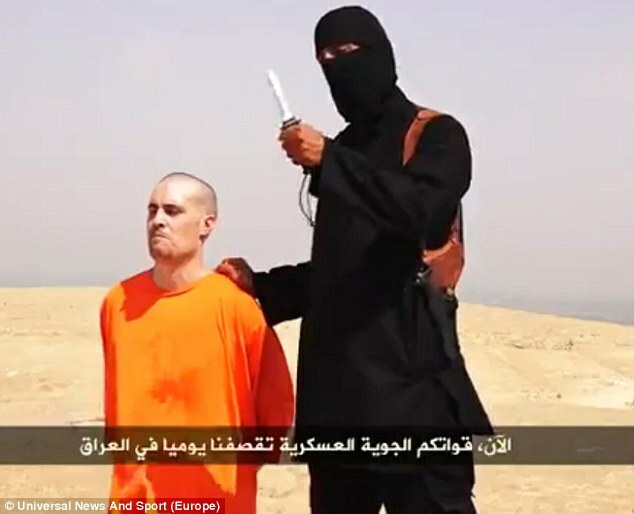 The security services are also close to establishing the identity of the killer who cut James Foley’s throat in a horrific propaganda video. Said to be a senior Islamic State operative, he was trusted earlier this year to negotiate a hostage exchange. Mr Cameron admitted it was increasingly likely Mr Foley was killed by a Briton. The security services are using advanced voice recognition techniques to try to identify the murderer seen in the five-minute IS video, which has been viewed by thousands of people online. The Briton, who uses his left hand and wears Timberland boots, speaks with what appears to be an East London accent as he makes a series of threats to President Obama and the West. Yesterday, a man who was held in the Syrian city of Raqqa claimed the fanatic is intelligent, educated and a follower of radical Islamic teachings. He said international hostages called ‘John’ and his fellow Britons The Beatles because they were from the UK. Anti-terror investigators are now seeking to establish that the voice in the video is that of the man brandishing the knife before Mr Foley, rather than a voiceover.